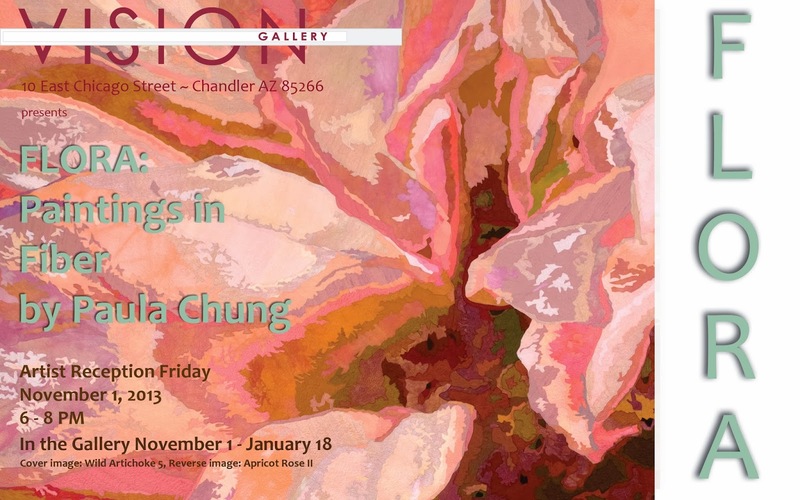 Just got back from a quick trip to Chandler, AZ where my florals are on display at the Vision Gallery. 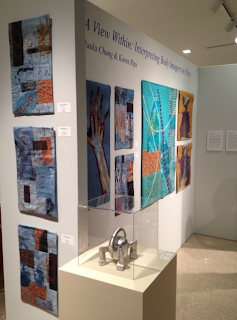 It was so thrilling to see so many of my pieces together so beautifully displayed. 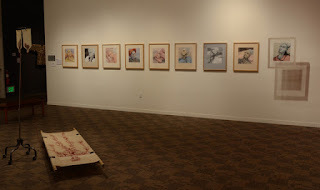 Eric Faulhaber, the director, and his crew did a grand job of hanging not only my show, but at the same time hung the show in the Chandler Center for the Arts, ARTrageous XVIII. Both shows will be showing until January 18th. Hope you can drop by. I'll post more images later, I promise. Karen's husband, Ted, took much better photos so I'm borrowing a few. This view gives you an idea of how wonderfully our show flows. Eric Faulhaber, the coordinator & his staff did a great job of layout, lighting and hanging. Karen & I are posing with Eric. 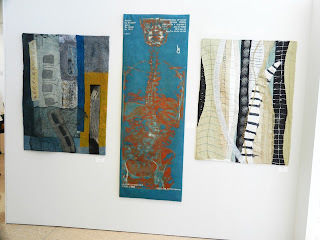 He and the board of Vision Gallery, should be commended in being one of the few venues that make a concerted effort to present and promote fiber art. 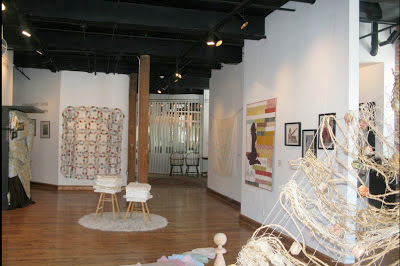 This is a shot of the largest space, showing some of our first work. 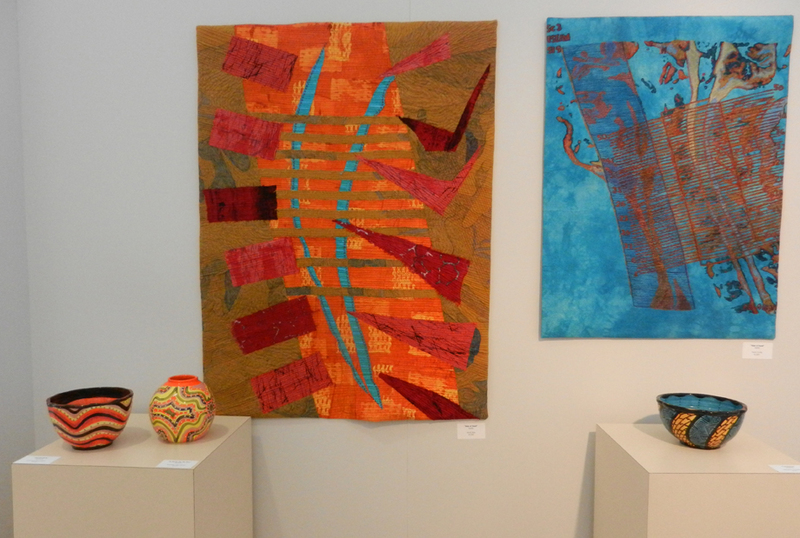 Vision Gallery also carries some incredible sculpture, ceramic, glass works and jewelry. 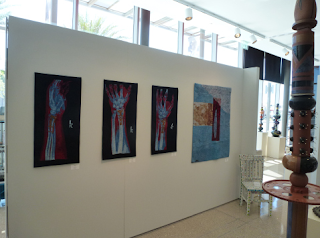 The placement of these pieces really enhanced our work, matching color and often shape. It is such an honor to have our debut at Chandler's Vision Gallery and so thrilling to see our work all together in a gallery setting. We hope it arouses interest in Chandler and surrounding areas and the fiber community. Most of the shots were taken Friday morning but here's a shot taken during the reception. 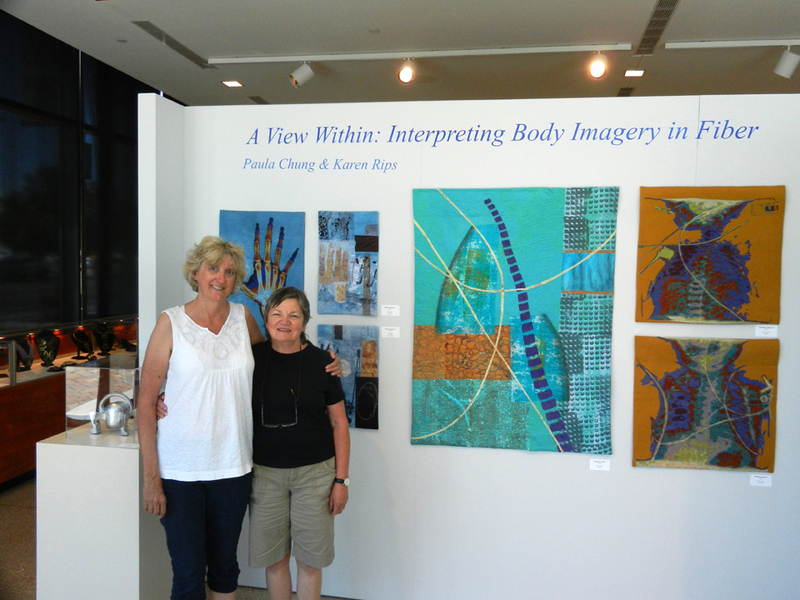 I just got back from a quick trip to the Vision Gallery in Chandler, AZ, where Karen Rips & I debuted our new body of work, A View Within. It was an exciting weekend and something I'm still processing. But before I share our incredible experience, I'd like to talk a little bit about the Vision Gallery and their director, Eric Faulhaber. 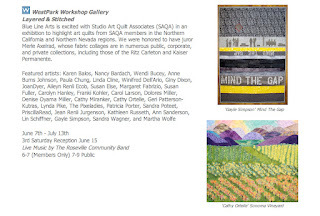 Eric has been a great promoter and champion of fiber arts for a long time and Vision Gallery has been home for an art quilt exhibition for 18 years. 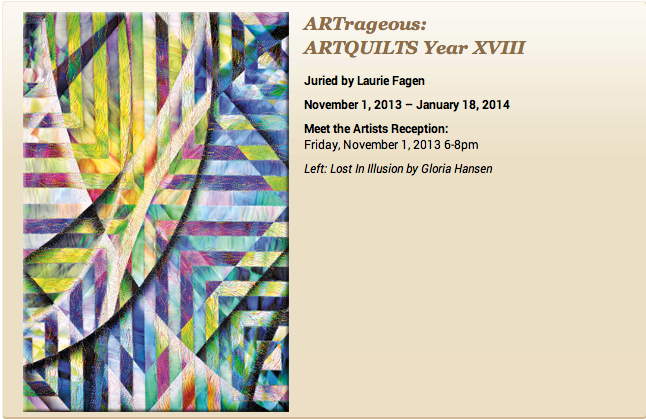 This year's exhibition, Art Quilts: XVIII, ARTrageous Art Quilts runs November 1 through January 18, 2014. 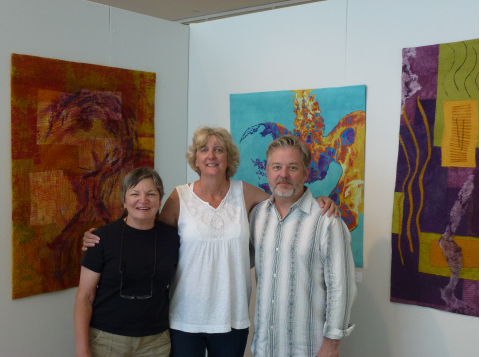 Eric and his board bring many fiber shows to the Chandler community and continue to be important figures promoting fiber arts. 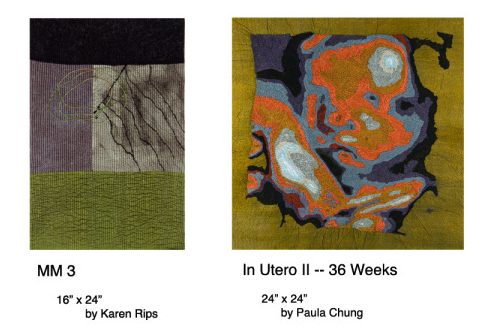 As fiber artists, we are especially grateful for the opportunity to present our diverse, interesting, ever changing world. 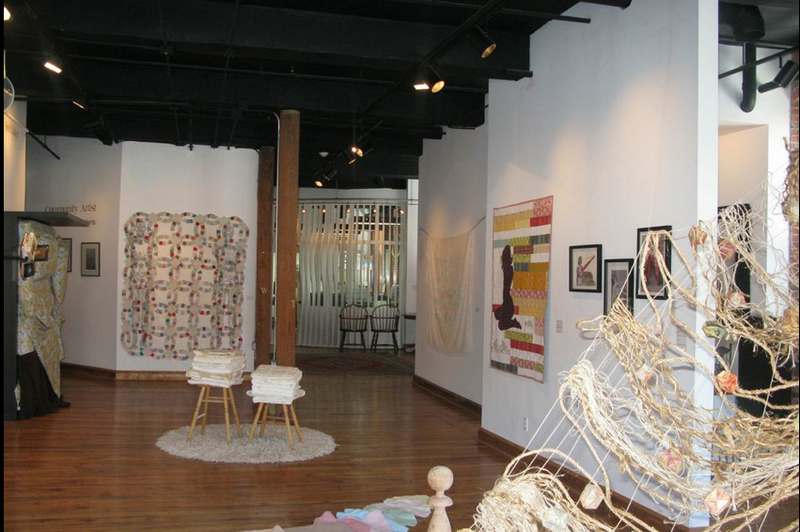 Fiber venues are rare in our nation, unfortunately, and having the opportunity to be apart of Vision Gallery's fiber presentations is a great honor. 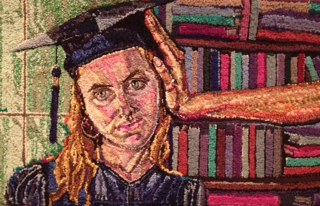 I'll share some of the work with you today and in future days. 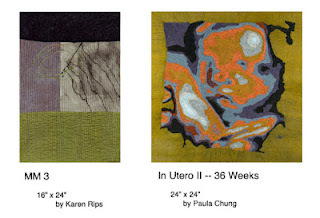 You can also visit our blog, A View Within and Karen's blog, Fiberartmusings. If you're not familiar with our work, Karen abstracts the image and I present a representational view. 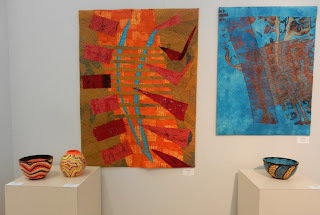 Vision Gallery is a beautiful gallery featuring highly skilled artists and craftsmen, presenting ceramics, glass, metal sculpture, jewelry, and of course, fiber. The staff, Sherry, Paula, and Justin are friendly and helpful and director Eric created a magnificent presentation with our work. We are so pleased with the placement, lighting and flow. We couldn't have asked for a better debut for our body of work, A View Within. 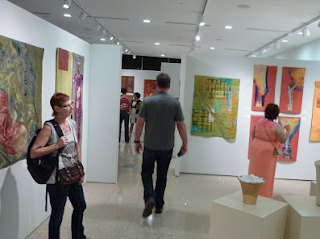 I hope you get a chance to visit Vision Gallery and experience it for yourself. 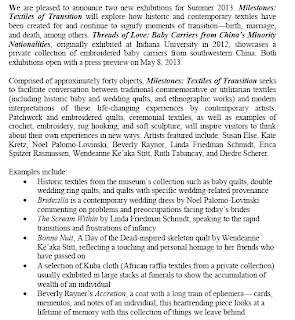 Our show will be running through Oct. 26th. 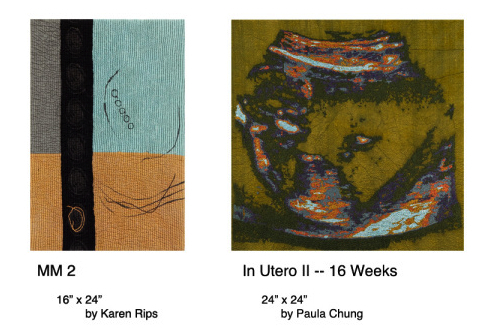 Recently I traveled to Southern California to combine my pieces with Karen Rips' work, my friend & collaborator for our show, Interpreting Body Imagery with Fiber at the Vision Gallery in Chandler, AZ this September. 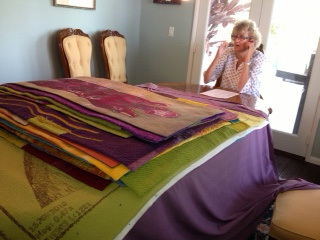 It was so great to see our body of work all together on Karen's table! 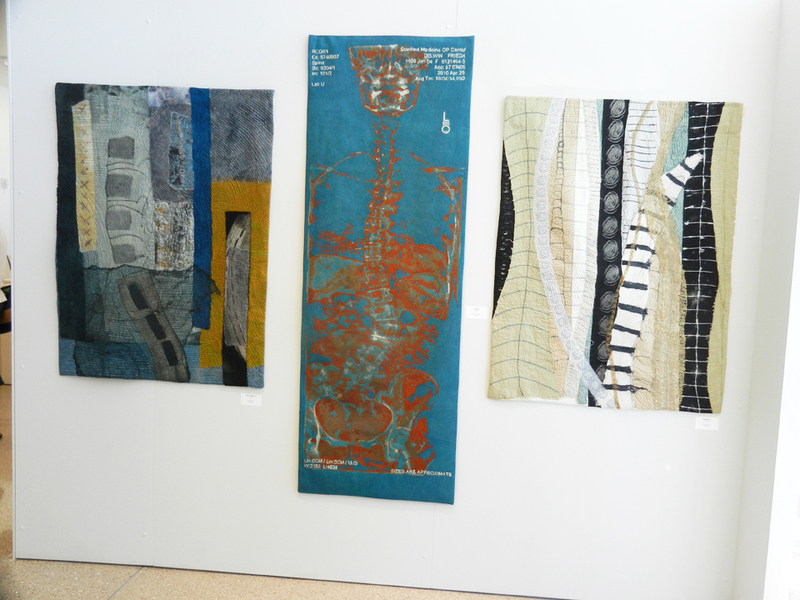 We had worked for almost 2 years developing our pieces and it was so gratifying to see them. 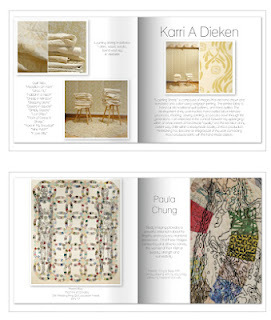 As our collaboration progressed, our work grew in complexity and diversity. And as our collaboration continues, so does our experimentation. 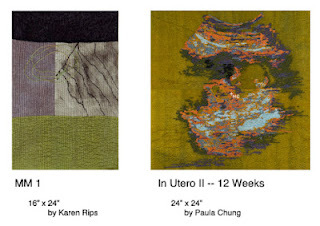 Karen continues to push the envelops of discharge, overdyeing, shibori, and texture creating processes through shrinkage and manipulation. Check out Karen's blog, Fiberart Musings. 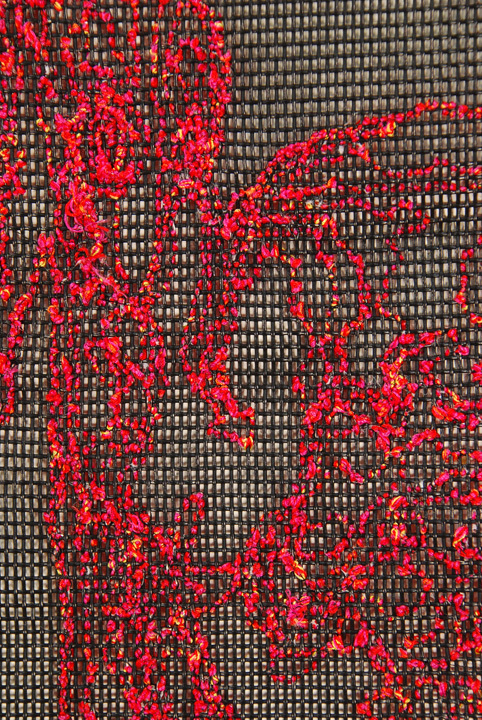 I'm experimenting with different stitching substrates to create work capable of hanging off the wall, in 2D and 3D presentations. Currently, I'm working on 14 MRI slices stitched onto screening, which I'll talk more about in future posts. 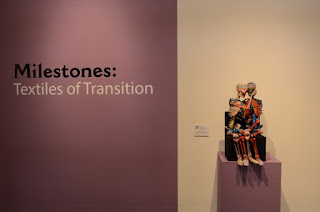 This is a very short post, but thought you might enjoy seeing an article by Brenna Barks of Wornthrough about the current show, Milestones: Textiles of Transition, at the San Jose Museum of Quilts & Textiles. It's running until the 21st. Hope you get a chance to see the show--it's quite a diverse collection of works. Karen Rips , my friend & fellow fiber artist, and I have been collaborating on work we're entitling, A View Within for the last few year. 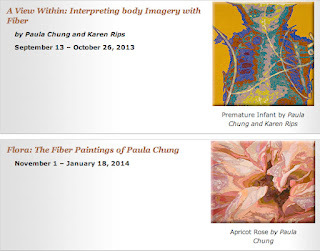 The body imaging we've chosen to represent are shown in representational and abstracted formats. 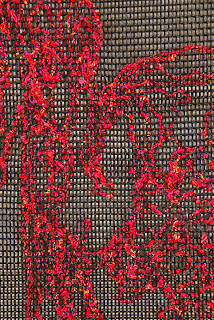 I free motion embroidery the original body images using combinations of several threads, stitched through 1 needle, on hand-dyed silk, then heavily stitch the background with monofilament thread. 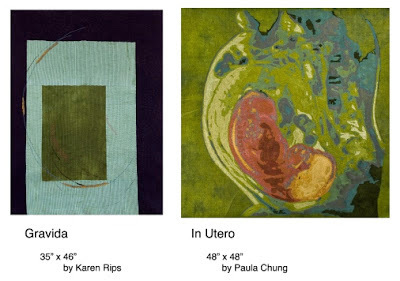 Karen abstracts the images, using many processes, including discharge, over painting, dyeing, shibori, and/or printing along with distressing & shrinking the fabrics. She heavily machine and hand stitches, using various kinds of threads. Recently, we've been writing proposals for venues throughout the country. 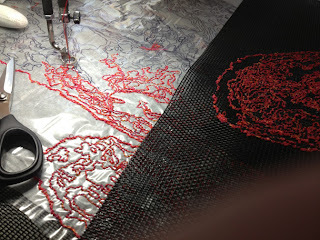 We thought it might be interesting to also share with you some of our work, in case you haven't seen our blog, A View Within. So we'll be sharing with you every once in awhile our work. I just couldn't pass sharing this. 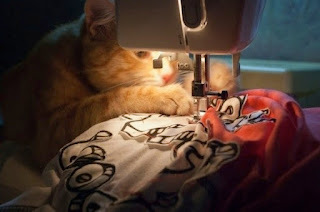 A fellow fiber artist, Betty Amador, sent this to me, knowing I'm a cat lady. 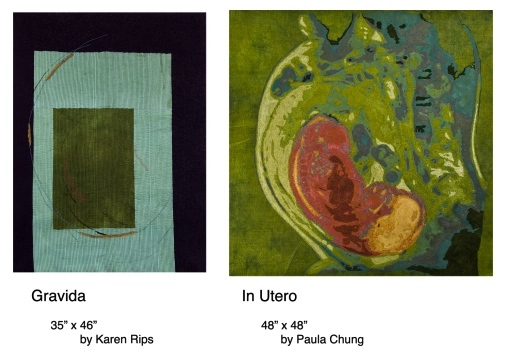 In the last few months Karen Rips and I have been seeking venues to show our collaborative venture, A View Within. We have received a show in at the Vision Gallery, Chandler, Arizona. 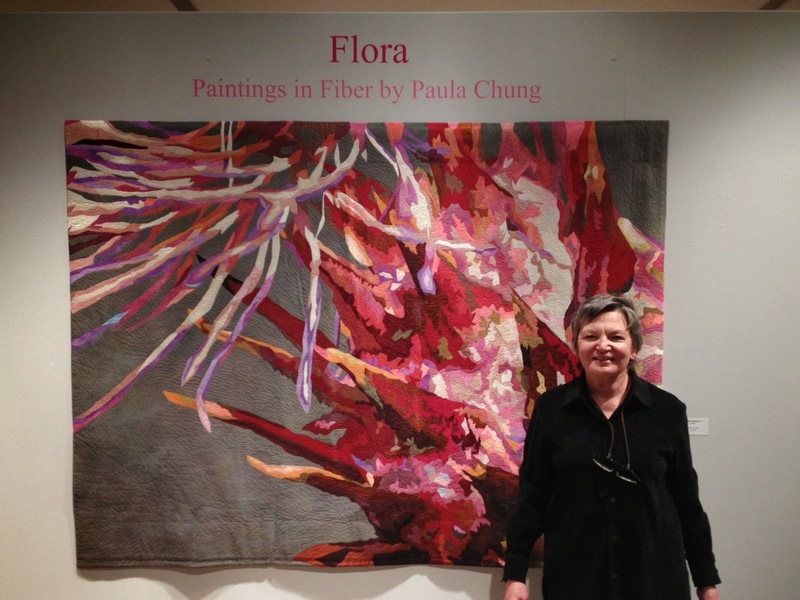 And to my surprise, they were interested in my floral work as well. This was taken from their exhibition website page. We're very excited to have our work seen as a whole collection and thrilled to be featured in this wonderful venue. We'll have more information soon. 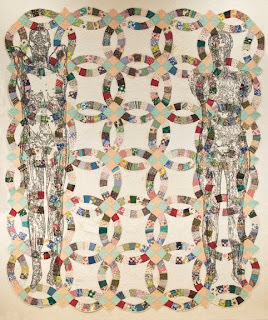 This piece entitled, 1 of 3 Female A, is part of a new series exploring the use of line to tell a story. 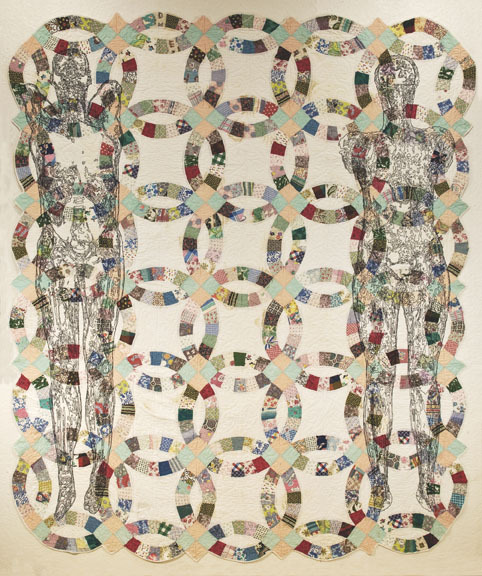 This piece has a companion piece, 1 of 3 Female B, speaking to our nations' weight problems, where 1/3 of the population are obese. You can see this piece at the upcoming NorCal SAQA Regional exhibit at the Roseville Blue Line Gallery. 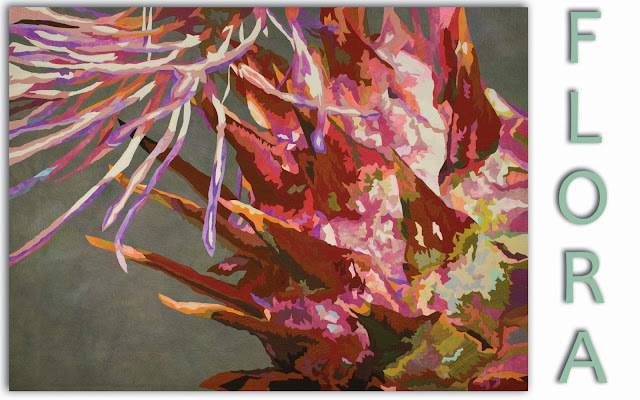 This piece is overdyed decorator fabric stitched with polyester threads and measures 27" x 60". 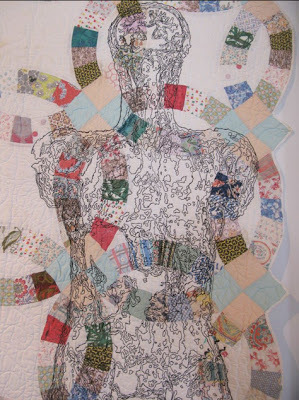 Another series I liked was by artist Linda Friedman Schmidt, of hooked discarded clothing. They are called, The Scream Within, Push and Prisoner of Childhood. 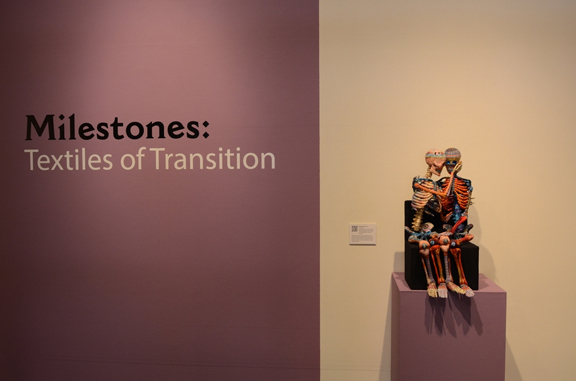 Sunday I attended the Opening reception of Milestones: Textiles of Transition, which runs through July 21st. It was grueling drive (4 hours each way from my home in Tahoe) but it was well worth it. 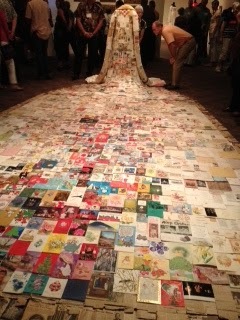 Above you see the entrance with, Forever Yours, a wonderful piece by Susan Else. 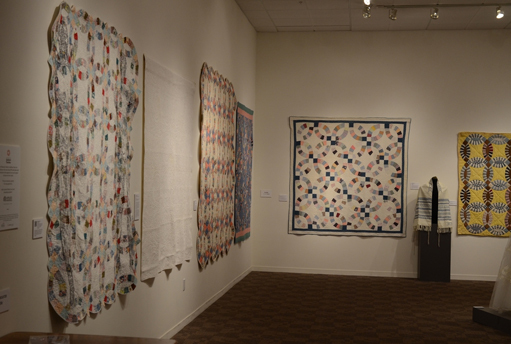 This shows my piece on the left and some wedding ring quilts from the museum's collection as well as a private collection. Arriving a little early, I was able to photograph a few works before our artist walk & talk began. 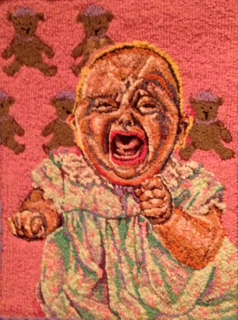 In the foreground, you see Collateral Damage, by artist Victoria May. 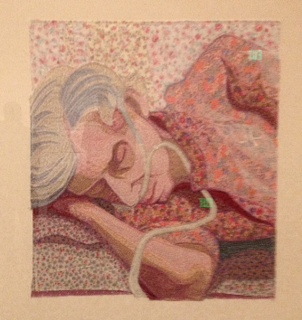 On the wall you see The Last Year, by Deidre Scherer, that portrays the final year of an elderly woman. 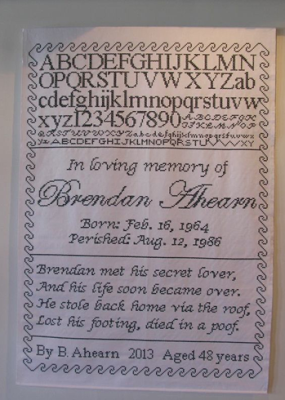 Below is one of the pieces, April 1968. 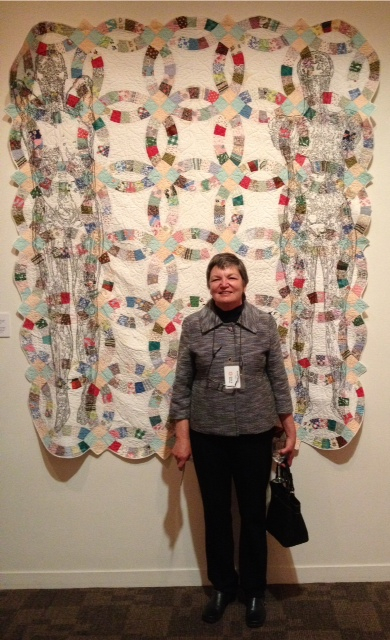 And here's a photo of me in front of my piece, taken by my friend Linda. 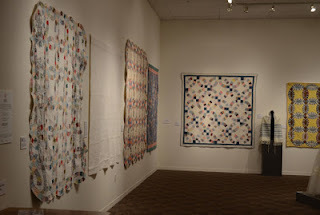 I am so fortunate to have been asked to participate in Milestones: Textiles of Transition at the San Jose Museum of Quilts and Textiles. 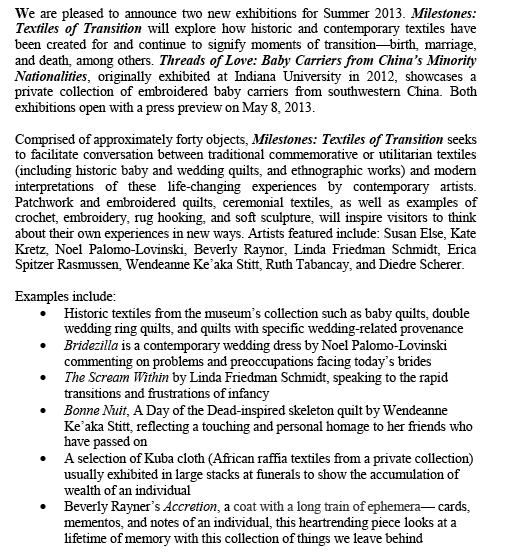 Deborah Corsini, the director, is curating the show, featuring antique and contemporary pieces. 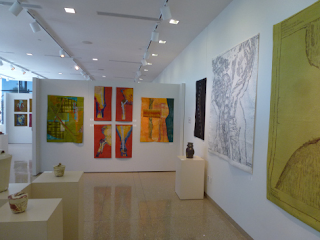 The show runs May 8 through July 21. 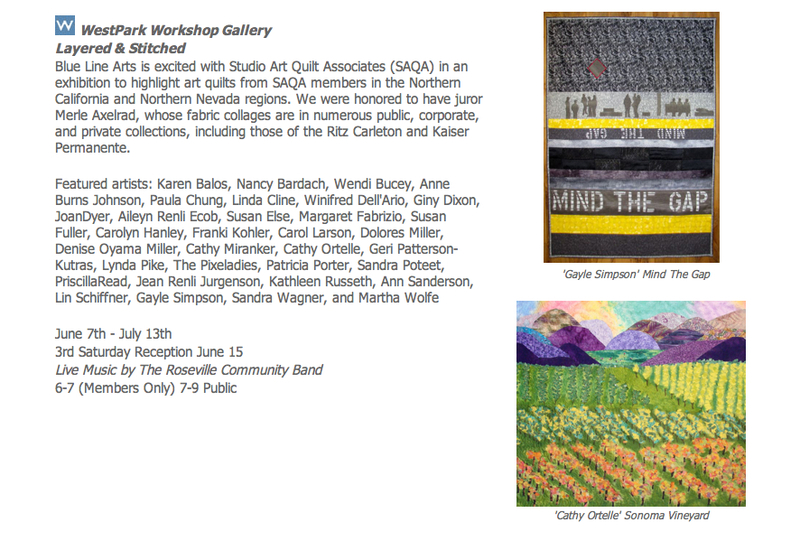 The reception will be 2-4 on June 2, where many of the artists will be discussing their pieces. 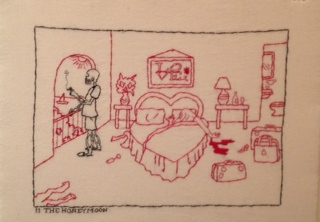 My piece, Marital Bliss, will be traveling there from show Joetta Maue's show, down to sleep. showing our work in down to sleep. 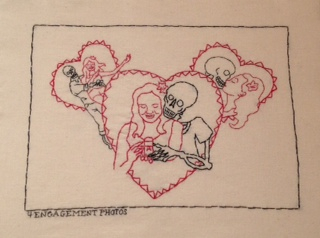 It's still in Lawrence, Massachusetts until April 12th at the Chester F. Sidell Gallery, so catch it, if you can. A very diverse show, it has large installation pieces, 2 and 3-D works that appeal as eye & tactile candy. 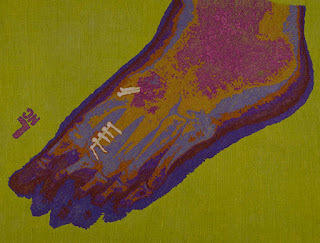 As you can see our friend, Lisa, has had a great deal of trouble and pain. We appreciate her generosity in sharing her image with us. 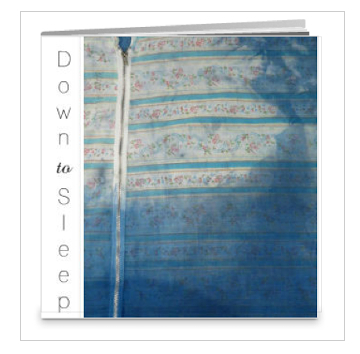 The down to sleep catalogue is now being offered on Joetta Maue's blog. I can't wait to see mine! 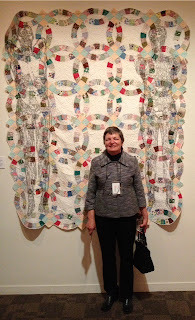 And I'm so pleased to see that Joetta used my page on her blog. The bed is a powerful locale in our daily life - with most of us beginning and ending our day here. We experience our most intimate moments of vulnerability, love, passion, sadness, and weakness here. 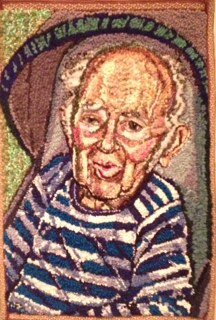 Most of us begin and end our life in this place that is piled with soft sheets and pillows. As a metaphor we can experience all the most significant emotions of human life in this one simple place of our daily life. 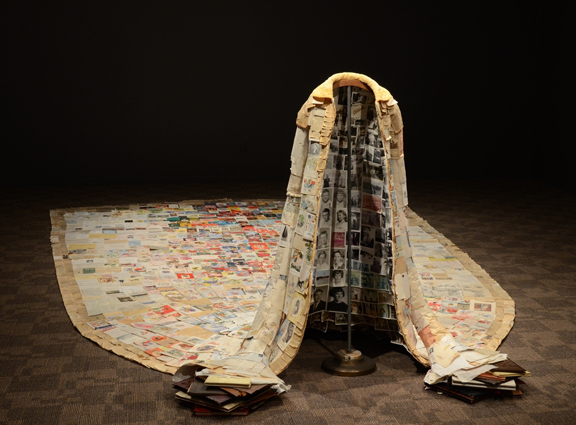 This exhibit is work that explores this liminal space with contemporary fiber practices.